Oh what I’d do to go back to a time when carbs didn’t exist in my knowledge bank and calorie counts wern’t plastered everywhere. That was a time when people would eat to their hearts content without a single feeling of guilt. Unfortunately for me, I spend most lunch times fluttering from place to place trading off what I want to the calorie content and carb intake. One day a week however, I allow myself a bit of indulgence (for lunch that is, there’s another day for dinner) and today was that day. 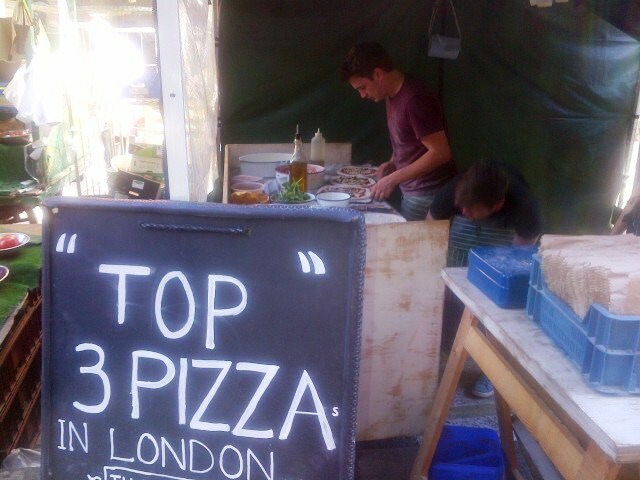 Being such a beautiful day, I hot footed it down to Berwick Street market and finally decided I should give in to my urge and give Pizza Pilgrims a shot. Despite having walked past it numerous times, I realised by not giving it a go, I was actually denying my loyal readers an honest opinion. So this ones for you, guys! 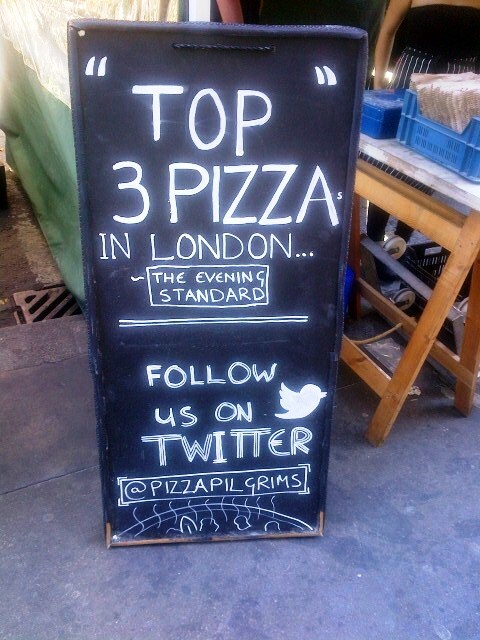 Besides the fact that there’s a big sign stating that its the ‘Top 3 Pizza in London’ as voted by the Evening Standard, how could I avoid it any longer!! 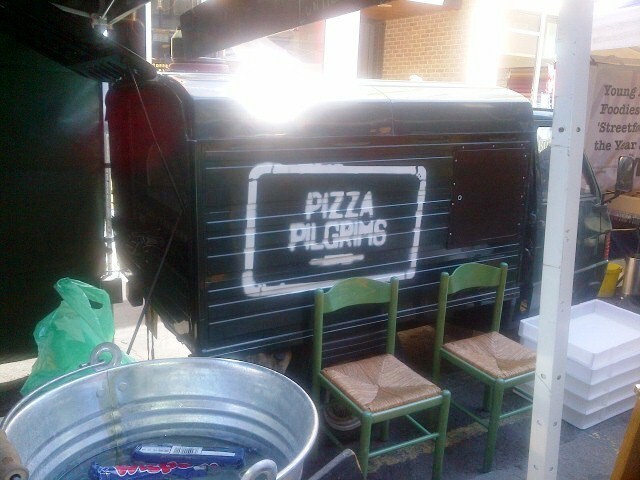 For those who either haven’t heard of or haven’t seen Pizza Pilgrims, they pitch up at Berwick St Market with a van which contains a wood burning type oven so you get that really authentic Italian pizza as the outcome. 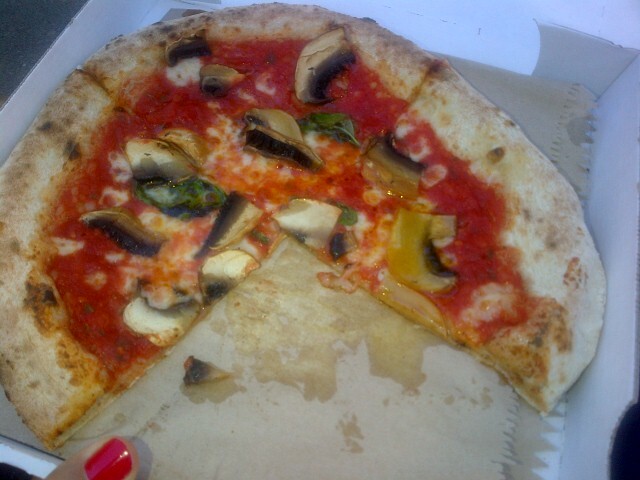 The choices are fairly simple, there’s the Margherita (£5), the Nduja which was described as a spicy sausage (£6) and then the one I went for, the Portobello Mushroom and Smoked Garlic (£6). So you’d think all this would take quite a while, but they claim the whole process takes approx 5 minutes from order to box and the cooking time is a minor 90 seconds. I ordered my Pizza and waited. Approx 5 minutes later, my name was called followed by one of the dedicated Pilgrims breaking into a rendition of the Hare Krishna classic of ‘Govind Jaya Jaya’ which I have to say, did 1) put a smile on my face 2) gave me the perfect t-shirt name for a friends wedding!! 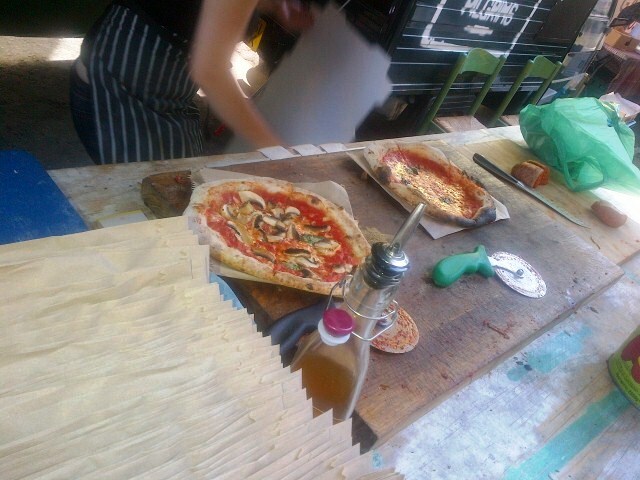 In what can only be described as purely rustic, the pizzas once out of the oven are served ‘open’ on a brown paper bag, or ‘closed’ in a pizza box, that is once you’ve drizzled it with the chilli oil. I decided I wasn’t going to make a mess of my white t-shirt and find somewhere to sit before I tuck in, after walking for 7 minutes, I gave up and decided to go the whole hog and bite as I walked. Whilst I was a little bit disappointed that the smoked garlic flavour didn’t hit me in the face, the overall flavour was quite subtle and fresh. It wasn’t over powering in any way but on the whole it was the perfect comfort food and I think I’ll be going back! So next time your passing through Soho, drop by for a quick bite of comfort food in a box! and is Santa Maria 300yers of tradition!!! and don’t eat pilgrims crap!!! Thank you for your suggestions, I will deff give one of those a try!